BANGOR, Maine — Basketball is a game of runs. 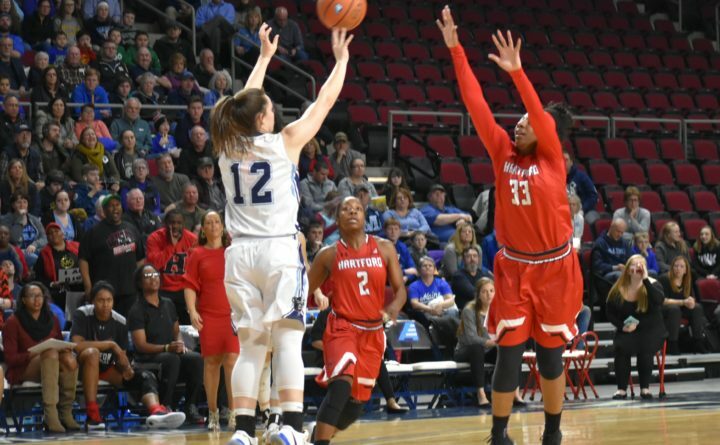 And it took just one run to decide the University of Maine women’s basketball game against the University of Maryland, Baltimore County at the Cross Insurance Center on Saturday afternoon. That’s because it was a 25-0 run by the Black Bears in the first half and it enabled them to cruise to an 84-44 America East victory over the Retrievers. The run gave 9-6 UMaine (2-0 AE) head coach Amy Vachon an opportunity to give everyone on the roster at least seven minutes of playing time which is useful in developing depth. Eleven of UMaine’s 12 players scored and 11 also grabbed at least one rebound. Fifth-year senior guard Parise Rossignol of Van Buren scored a game-high 19 points in 21 minutes and she also had four rebounds for UMaine. It was the seventh time in her last 10 games that she scored in double figures and the second straight game in which she has been the team’s leading scorer. She scored 18 in Wednesday’s 67-46 win over New Hampshire. Sophomore Kelly Fogarty came off the bench to score 14 points and Fanny Wadling, in her second game back after missing 10 games with a concussion, provided nine points, six rebounds and four assists. Sutton (4 rebounds, 3 assists) and Doga Alper (6 rebounds) scored eight points each. Maddy McVicar added seven points and four rebounds and Blanca Millan chipped in six points, two assists, two steals and two blocked shots. Dor Saar had six points and four assists. UMaine’s 40-point victory margin was its largest since a 96-54 win over Robert Morris in 2002. The point differential was also UMaine’s biggest over a conference foe since it defeated Drexel by 42 in 1997. Tyler Moore’s 11 points and Kayla Jackson’s 10 points and six rebounds led UMBC (7-7 overall, 0-1 AE). Janee’a Summers added nine points, two assists and two steals. The Black Bears built a 54-14 halftime lead as they shot a blistering 69 percent from the floor (20-for-29) including an even more impressive 71.4 percent from beyond the 3-point arc (10-for-14). UMBC, which has lost seven of its last eight after a 6-0 start, shot just 22.7 percent from the floor (5-for-22) in the first 20 minutes and 18.2 percent beyond the 3-point arc. UMaine also outrebounded UMBC 19-9 and forced 11 Retriever turnovers while turning the ball over just three times. UMaine wound up shooting 58.8 percent from the floor (30-for-51) and 55.6 percent beyond the 3-point arc (15-for-27) while UMBC shot 31.4 percent from the floor (16-for-51) and 17.4 percent (4-for-23) from 3-point land. UMaine scored the game’s first seven points and never looked back. UMBC was able to close within 13-8 midway through the first quarter but that is when the Black Bears reeled off 25 straight points to expand the lead to 38-8. Eight players contributed points during the 25-point run led by Fogarty’s six and Wadling’s four. There were five 3-pointers: Two by Fogarty and one apiece by Saar, Alper and Rossignol. Eleven Black Bears found their way onto the scoresheet in the first half led by Rossignol’s 16. Wadling, Saar, Alper and Fogarty each had six. “It was a perfect storm: Our lack of communication and them burying 3,” said UMBC assistant coach Carly Cassidy-Dewey, who is filling in for head coach Phil Stern, who has been on a leave of absence since Dec. 6. UMaine visits Vermont for a 7 p.m. game on Wednesday.